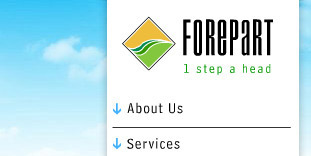 Forepart is an innovative visual communications company located in India (Pondicherry)and serving clients worldwide. Forepart has a team of designers and developers with extensive experience in Branding, Identity Design, Web Site Design and Development, Graphic Design, Interface Design, Multimedia, Animation and Print Production. And also we are dealing with Web hosting. Our size is scalable. Our core staff collaborates as necessary with a network of specialized consultants available on short notice. Depending upon the engagement, we put together an appropriate team. We work with a limited number of projects at a time, providing you with the very personal service you need. Most of our work comes from referrals from satisfied clients. If you are looking for an effective website that integrates quality design, content, smart architecture and search engine optimization, we would be happy to provide you with a solution. We are not limited by our location - you can be anywhere in the world and we will be able to establish a good working relationship with you.